CD4+Foxp3+ regulatory T cells (Tregs) protect the kidney during AKI. We previously found that IL-2, which is critical for Treg homeostasis, upregulates the IL-33 receptor (ST2) on CD4+ T cells, thus we hypothesized that IL-2 and IL-33 cooperate to enhance Treg function. We found that a major subset of Tregs in mice express ST2, and coinjection of IL-2 and IL-33 increased the number of Tregs in lymphoid organs and protected mice from ischemia-reperfusion injury (IRI) more efficiently than either cytokine alone. Accordingly, we generated a novel hybrid cytokine (IL233) bearing the activities of IL-2 and IL-33 for efficient targeting to Tregs. IL233 treatment increased the number of Tregs in blood and spleen and prevented IRI more efficiently than a mixture of IL-2 and IL-33. Injection of IL233 also increased the numbers of Tregs in renal compartments. Moreover, IL233-treated mice had fewer splenic Tregs and more Tregs in kidneys after IRI. In vitro, splenic Tregs from IL233-treated mice suppressed CD4+ T cell proliferation better than Tregs from saline-treated controls. IL233 treatment also improved the ability of isolated Tregs to inhibit IRI in adoptive transfer experiments and protected mice from cisplatin- and doxorubicin-induced nephrotoxic injury. Finally, treatment with IL233 increased the proportion of ST2-bearing innate lymphoid cells (ILC2) in blood and kidneys, and adoptive transfer of ILC2 also protected mice from IRI. Thus, the novel IL233 hybrid cytokine, which utilizes the cooperation of IL-2 and IL-33 to enhance Treg- and ILC2-mediated protection from AKI, bears strong therapeutic potential. AKI, often caused by ischemia-reperfusion injury (IRI),1 is a major contributor to morbidity and mortality in hospitalized patients.2–5 Although the pathogenesis is multifactorial, uncontrolled inflammation contributes to AKI,6–8 and therefore inhibiting inflammation is important in several renoprotective approaches.6,9,10 Forkhead box P3 (Foxp3)–expressing regulatory T cells (Tregs) are anti-inflammatory cells.11–15 Depletion of Tregs worsens IRI, whereas supplementation of Tregs is protective.16–18 Although autologous Tregs provide a transformative approach to therapy, obtaining sufficient numbers of ex vivo expanded Tregs remains a significant problem.19,20 Furthermore, there are many challenges in cell-based therapies, such as cell heterogeneity, phenotype retention, and safety and regulatory issues.21 Hence, finding mechanisms for expanding endogenous Tregs is important. We hypothesized that because of their dependence on IL-2 and the ability of IL-2 to upregulate ST2, Tregs may also express ST2. Further, IL-33 may have a role in activation and recruitment of Tregs to restrict inflammation during tissue damage. 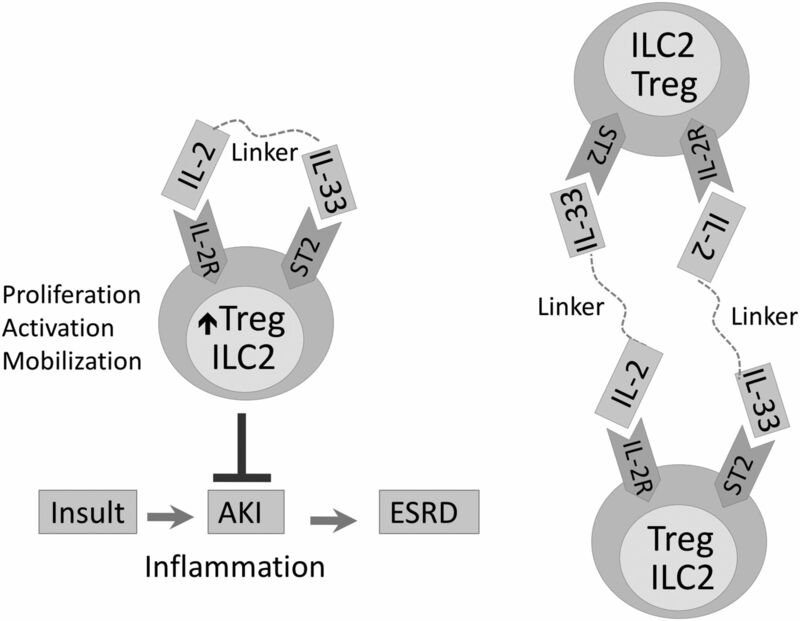 Here, we demonstrate that Tregs express the IL-33 receptor ST2, that IL-2 and IL-33 cooperate to promote Tregs, and that this cooperative function can be used to prevent inflammation in AKI. We generated a novel hybrid cytokine, IL233, which maintains IL-2 and IL-33 activities in a single molecule and was found to be better than a mixture of IL-2 and IL-33, which in turn was better than either cytokine alone to increase Tregs and protect mice from IRI. IL233 also increased ILC2, which were also protective in IRI. IL233 is also protective in drug-induced nephrotoxic injury and has therapeutic potential in AKI. RT-PCR analysis for ST2 expression on major CD4+ T cell subsets showed that ST2 mRNA was expressed in Th2 cells and freshly sorted natural Tregs (nTrs), but undetectable in inducible Tregs (iTrs; Supplemental Figure 1). Flow cytometry on splenocytes from naïve B6 mice confirmed that a third of CD4+Foxp3+ Tregs expressed ST2, whereas the non-Treg CD4+Foxp3− T cells did not (Figure 1, A and B). Coinjection of IL-2 and IL-33 significantly increased Foxp3+CD4+ Tregs in blood and spleen (Figure 1, C–E) compared with saline, IL-2, or IL-33 alone. This indicates that ST2 expression renders Tregs responsive to IL-33 and that IL-2 and IL-33 cooperate to increase Tregs. IL-2 and IL-33 cooperate to increase Tregs. (A) Gating strategy to verify ST2 expression on Tregs. (B) ST2 expression on splenic Tregs (Foxp3+CD4+ T cells) in naïve mice compared with Foxp3−CD4+ T cells. (C–E) Mice were intraperitoneally injected for five consecutive days with 66 pmol per mouse per day each of IL-2, IL-33, or a mixture of IL-2 and IL-33, and cells were harvested on day 8. Proportion of CD4+Foxp3+ Tregs, normalized over saline-injected control mice, in blood (C) and spleen (D). (E) Absolute number of splenic Tregs. A combination of IL-2 and IL-33 was more effective than either cytokine alone in increasing Tregs in blood and spleen. Symbols represent individual mice; mean±SEM is shown (n=5). **P<0.01; ***P<0.001. Next, we tested whether treatment with IL-2 and IL-33 either alone or in combination protects mice from IRI (Figure 2A). Saline-treated controls showed severe loss of renal function after IRI with elevated plasma creatinine (PCr) levels. Treatment with IL-2 or IL-33 alone partially preserved kidney function, whereas the combination of IL-2 and IL-33 yielded complete protection (Figure 2B). Histologic analysis (Figure 2C) for acute tubular necrosis (ATN; scored in Figure 2D) correlated with renal function. The marked infiltration of leukocytes (CD45+) and neutrophils (Gr1+CD11b+) in kidneys after IRI (saline-treated mice) was reduced after treatment with IL-2 or IL-33 alone, and nearly completely inhibited by the combination of the same doses of IL-2 and IL-33 (Figure 2E). Thus, IL-2 and IL-33 as a mixture is more efficient in protecting mice from IRI than either cytokine alone. IL-2 and IL-33 cooperate to protect from IRI. (A) Mice were injected for five consecutive days with 66 pmol per mouse per day of IL-2, IL-33, or a mixture of IL-2 and IL-33 before subjecting them to 26 minutes of bilateral ischemia on day 8, followed by 24 hours of reperfusion. PCr values (B) and ATN score (C) showed that IL-2 and IL-33 offered partial protection from IRI compared with saline-injected controls, whereas the combination of IL-2 and IL-33 at an identical dose completely protected the mice from AKI. (D) Representative hematoxylin and eosin–stained kidney sections, with outer medulla in right column. Scale bars, 250 μM (left) and 50 μM (right). (E) Flow cytometry of kidneys to analyze inflammation measured as infiltration of leukocytes (CD45+ cells) and neutrophils (Gr1+CD11b+ cells) shows that kidneys had less inflammation after treatment with IL-2 and IL-33 compared with saline controls, whereas there was almost no infiltration of leukocytes or neutrophils with the combination of IL-2 and IL-33. The horizontal bars in E show significant differences in the indicated comparisons. Symbols represent individual mice; mean±SEM is shown (n=5). *P<0.05; ***P<0.001. We hypothesized that linking IL-2 and IL-33 in one molecule may be more efficient in targeting the IL-2 and IL-33 activities to Tregs by simultaneous availability of IL-2 and IL-33 to the same cell. We generated a fusion cytokine (termed IL233; Figure 3A), where IL-2 was joined to the N terminus of the IL-33 cytokine domain, separated by a linker to avoid steric hindrance (Supplemental Figure 2).29 IL233, IL-2, and IL-33 were expressed in Escherichia coli and purified to near homogeneity (Supplemental Figure 3). Mice were injected with saline, a mixture of IL-2 and IL-33, or IL233 (66 pmol each per day) for 5 days. Compared with the IL-2 and IL-33 mixture, IL233 induced a significantly greater increase in Tregs in blood and spleen (Figure 3, B–D). To compare the protective efficacy of IL233 with the mixture of IL-2 and IL-33 in IRI, mice were injected with saline, a mixture of IL-2 and IL-33, or IL233 hybrid cytokine at two different doses (22 or 66 pmol) daily for 5 days before IRI (Figure 3E). IL233 (at either dose) protected mice from IRI, whereas the mixture of IL-2 and IL-33 was ineffective at the dose of 22 pmol but equally protective at the higher dose of 66 pmol (Figure 3, F and G). Thus, IL233 was effective at a three-fold lower dose than an equimolar mixture of IL-2 and IL-33 to protect from IRI. Novel fusion cytokine IL233 bearing IL-2 and IL-33 activities in one molecule offers better protection than IL-2 and IL-33 used as a mixture. (A) Schematic representation of IL233 fusion cytokine consisting of IL-2 aa residues 21–169 joined via a 15-aa linker (GGGGS)3 to the C-terminal cytokine domain of IL-33 (aa residues 109–266). (B) Mice were injected with 66 pmol per mouse per day with a mixture of IL-2 and IL-33 or IL233 for 5 days, and mice were analyzed on day 8. IL233 was better than equimolar doses of IL-2 and IL-33 injected as a mixture in increasing Tregs in blood and spleen (C), measured as proportion of CD4+Foxp3+ cells in the CD4+ T cell gate. (D) Absolute number of Tregs per spleen in mice was also higher in mice treated with IL233. (E) Mice were pretreated with saline or IL233 or a mixture of IL-2 and IL-33 at two different doses (22 or 66 pmol, administered intraperitoneally) daily for five consecutive days before subjecting them to 26 minutes of bilateral ischemia. Mice were euthanized after 24 hours of reperfusion, and PCr (F) and ATN scores (G) show that the mixture of IL-2 and IL-33 at a dose of 22 pmol was unable to restrict renal dysfunction and injury, whereas an equimolar dose of IL233 completely preserved renal structure and function. Symbols represent individual mice; mean±SEM is shown (n≥5). *P<0.05; **P<0.01; ***P<0.001. Mice treated with IL233 had two times the total number of Tregs in the kidneys than saline-treated controls (Figure 4, A and B). Compared with sham-operated controls, splenic Treg proportion in mice undergoing IRI declined, which was more pronounced if mice were pretreated with IL233 (Figure 4C). 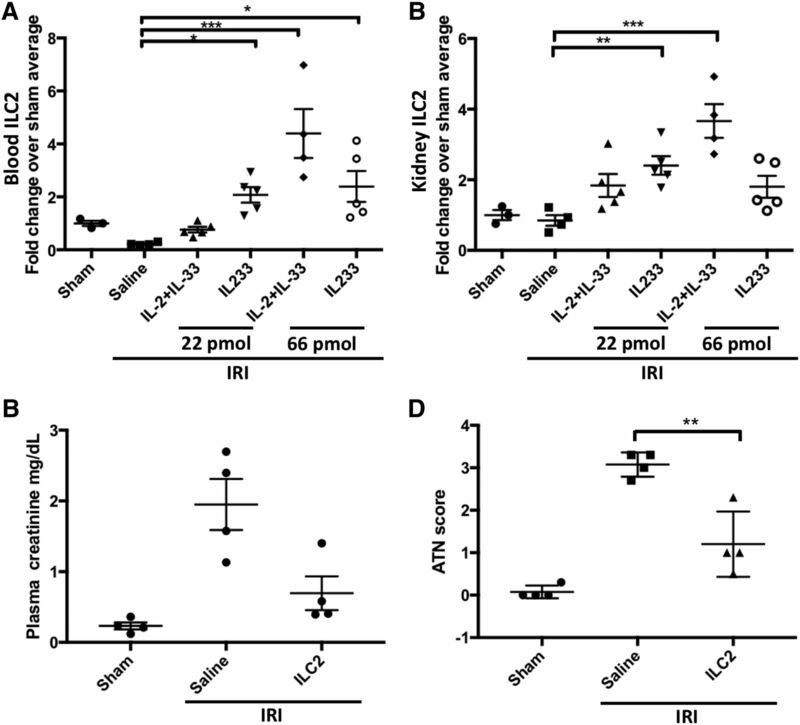 Correspondingly, much higher Treg numbers and Treg proportions were present in the kidneys of IL233-treated mice post-IRI compared with sham-operated, saline-treated IRI mice or untreated pre-IRI mice (Figure 4D, Supplemental Figure 4), suggesting that IL233 may enable mobilization of Tregs from spleens for recruitment to the injured kidneys. IL233 fusion cytokine enhances mobilization, intrarenal levels, suppressive function, and the protective ability of Tregs. B6 mice were injected intraperitoneally for five consecutive days with 66 pmol per mouse per day of IL233 (n=7) or saline (n=5). (A) Proportion of CD4+Foxp3+ Tregs in the CD45 gate and (B) absolute number of Tregs were analyzed in the kidney by flow cytometry. Mice treated with 66 pmol per mouse per day of IL233 (n=10) or saline (n=8) for 5 days were subjected to 26 minutes of bilateral ischemia on day 8 and analyzed 24 hours later for Tregs in spleen (C) and kidneys (D). (E) Tregs were isolated from mice treated with saline or IL233 (single injection of 132 pmol 24 hours before isolation of cells) and compared for their ability to suppress proliferation of naïve CD4+ T cells (responder T cells [Tresp]) in a CFSE dilution assay. IL233 treatment improved the in vitro suppressive ability of Tregs. Mean±SEM is shown in bar graphs (A–E). (F) Mice were injected either with saline or a single dose of 132 pmol of IL233, and 24 hours later, Tregs were isolated from the spleens of these mice. The isolated Tregs (50×103 or 100×103 per mouse, administered intravenously; or saline as control) were then injected into recipient mice; 24 hours later, the recipient mice were subjected to 26 minutes of bilateral ischemia. PCr (G) and ATN score (H) were analyzed after 24 hours of reperfusion. Tregs isolated from IL233-treated mice offered better protection to the recipients than Tregs isolated from saline-treated mice. Symbols represent individual mice; mean±SEM is shown. *P<0.05; **P<0.01. 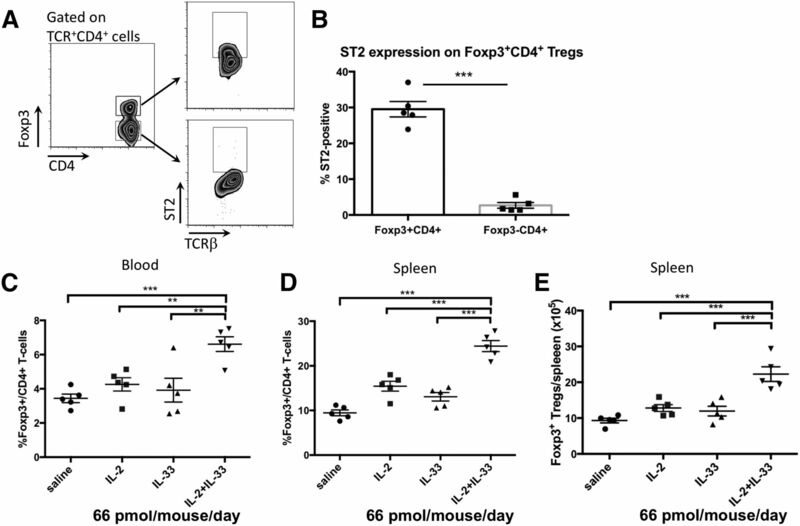 In a T cell suppression assay, CD4+CD25Hi Tregs isolated from spleens of mice pretreated with a single 132-pmol dose of IL233 (see Supplemental Figure 5 for dosage) suppressed T cell proliferation (at 1:1 and 1:2 ratios of Treg-to-responder T cells) better than control Tregs from saline-treated mice (Figure 4E). We compared the ability of Tregs isolated from saline- or IL233-treated mice to protect from IRI in an adoptive transfer experiment.16 Tregs were injected at two different doses in the recipients, which were then subjected to IRI (Figure 4F). At lower doses (50×103), Tregs from IL233-treated mice were better at protecting the recipient mice from IRI than Tregs from saline-treated mice, as determined by PCr and ATN score (Figure 4, G and H). Although mice receiving 100×103 Tregs (irrespective of the donor) had PCr values similar to that of sham mice (Figure 4G), Tregs isolated from IL233-treated mice offered significantly better protection from tissue damage in the recipients subjected to IRI, compared with Tregs from saline-treated mice (Figure 4H). Because ILC2 express CD25 and ST2,30 we investigated the effect of a combination of IL-2 and IL-33 or IL233 alone on ILC2. The mixture of IL-2 and IL-33 at 22 pmol/d, which was unable to protect from IRI (Figure 3), did not increase ILC2 levels (Figure 5A). However, compared with saline controls, a significant increase in the proportion of ILC2 was observed in the blood and kidneys of mice treated with IL233 at 22 and 66 pmol/d and with mice treated with the IL-2 and IL-33 mixture at 66 pmol/d (Figure 5, A and B), suggesting that the IL233-mediated increase in ILC2 may participate in protection from IRI. 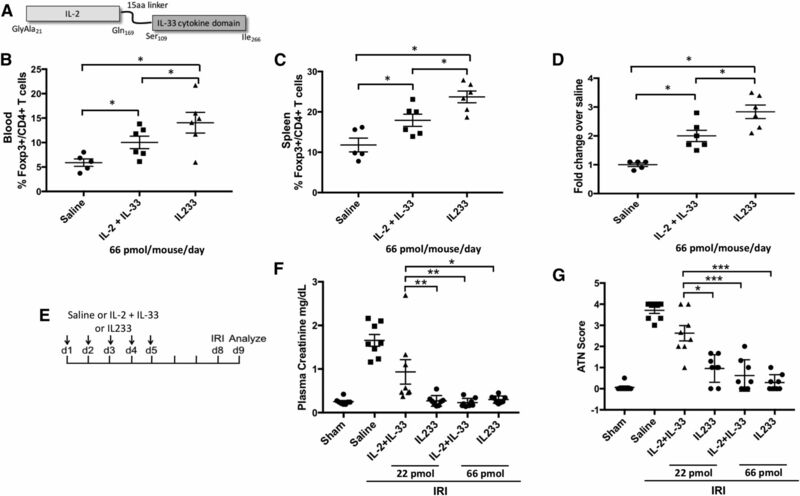 To investigate a direct role of ILC2 in IRI, ILC2 isolated from the spleens of donor wild-type mice and expanded ex vivo with IL233 were washed and injected (intravenous 5×105 ILC2) into recipient mice 24 hours before IRI. Adoptive transfer of ILC2 was sufficient to significantly protect mice from IRI (Figure 5, C and D) although not as robustly as Treg transfer (Figure 4, G and H). Treatment with IL233 also promotes ILC2, which offer protection from IRI. Mice were treated with 66 pmol/d each of a mixture of IL-2 and IL-33 or IL233 for 5 days. On day 8, mice were subjected to 26 minutes of bilateral ischemia followed by 24 hours of reperfusion. The proportion of ILC2 was analyzed by flow cytometry as lineage-negative Thy1.2+ST2+ cells. ILC2 levels in the blood (A) and kidney (B) of mice treated with IL233 were higher than in those treated with the mixture of IL-2 and IL-33 or saline when compared for the 22-pmol dose, and ILC2 numbers correlated with protection from IRI. Compared with no cell control (saline), adoptive transfer of 5×105 ILC2 expanded ex vivo with IL233, 24 hours before IRI surgery also protected mice from IRI as indicated by PCr values (C) and ATN score (D). Symbols represent individual mice; mean±SEM is shown. *P<0.05; **P<0.01; ***P<0.001. We investigated whether IL233 can be used therapeutically. Because a 26-minute bilateral ischemia is too severe for long-term evaluation of therapeutic applications,31 we reduced the ischemic time to 24 minutes (Figure 6A). Although all of the saline-treated mice lost weight, became moribund, and had to be euthanized within 3 days, mice treated with IL233 recovered their body weight, appeared healthy, and survived until 4 weeks after IRI, when the experiment was terminated (Figure 6, B and C), IL233-treated mice were protected from IRI-induced renal dysfunction (Figure 6, D and E), tubular necrosis, and inflammation (Figure 6, F and G). IL233 protects from IRI therapeutically when administered post-IRI surgery. (A) Mice were subjected to 24 minutes of bilateral ischemia and, beginning 2 hours after the start of reperfusion, they were injected with saline or 66 pmol per mouse per day for 5 days and were followed for 4 weeks after IRI. All of the saline-treated mice lost weight (B), became moribund, and had to be euthanized (C), whereas all of the IL233-treated mice rapidly recovered and remained healthy, with normal renal function as measured by PCr (D) and BUN (E). (F) Histologic analysis of hematoxylin and eosin–stained kidney sections was performed at necropsy of moribund saline-treated mice and on day 28 for IL233-treated mice. Scale bars, 250 μM (left) and 50 μM (right). Pictures at higher magnification in the right panels are taken from outer medulla. The saline-treated mice showed severe tubular necrosis, whereas all of the IL233-treated mice had preserved renal morphology. (G) ATN scores for IL233-treated mice were similar to the sham-operated controls. n=4 for sham and saline and n=5 for IL233; mean±SEM is shown in (B, D, E, and G). ANOVA with repeated measures showed that change in body weight and increase in PCr and BUN was significantly different from day 0 at days 1, 2 and 3. The change in body weight of the IL233-treated (except for days 1–5) and sham-operated mice did not differ significantly from each other and before IRI. *P<0.05 for saline versus IL233 comparison and #P<0.05 for sham versus IL233 comparison. We also tested whether IL233-mediated immunomodulation can protect in other forms of renal injury, such as cisplatin-induced nephrotoxicity, where inflammation plays a role in pathogenesis32 and Tregs have been shown to be protective,33 and doxorubicin-induced nephropathy, where both renal tubules and glomeruli are affected in rodents and pathogenesis is exacerbated by immune mechanisms.34 The majority of saline-treated, cisplatin-injected mice had reduced renal function and considerable renal damage, whereas all of the mice injected with IL233 were protected (Figure 7, B–D, Supplemental Figure 6D). Although the proportion of Tregs in the blood of the IL233 group was significantly elevated before cisplatin, as expected, the proportion of Tregs in the blood and spleen did not differ significantly at necropsy (Supplemental Figure 6). In mice pretreated with saline and then injected with doxorubicin, all of the mice had reduced renal function with elevated PCr and BUN levels, and showed marked tubular necrosis, proteinaceous casts, and glomerular pathology compared with untreated control mice, whereas the mice pretreated with IL233 and subjected to doxorubicin were protected from renal dysfunction and pathology (Figure 8, Supplemental Figure 7D). Compared with the saline-treated mice, the proportion of Tregs in IL233-treated mice was higher in the blood before doxorubicin treatment as well as in the spleens at necropsy (Supplemental Figure 7). 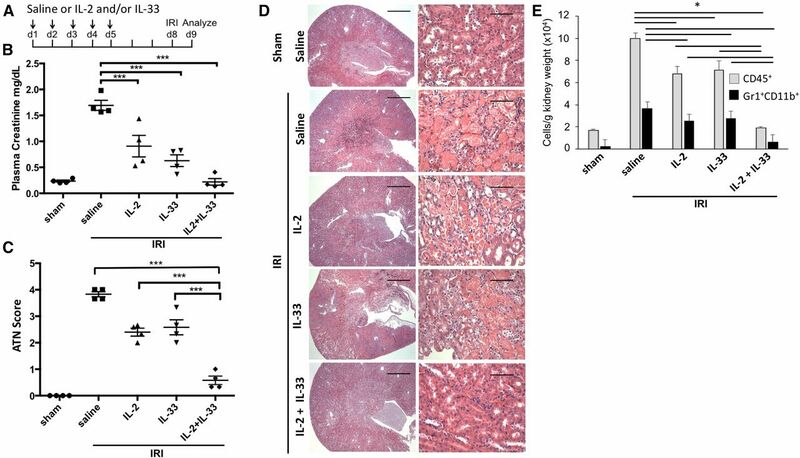 IL233 protects from cisplatin-induced nephrotoxic injury. (A) Mice (12 weeks old), treated for 5 days with saline or 66 pmol per mouse per day of IL233, were injected with 20 mg/kg cisplatin 3 days after the last IL233 injection and followed for 5 more days. The saline-pretreated mice showed reduced renal function after cisplatin injection, shown by higher PCr (B) and BUN values (C) on days 3 and 4, whereas PCr and BUN did not increase in the mice pretreated with IL233 before cisplatin administration (as verified by ANOVA with repeated measures). 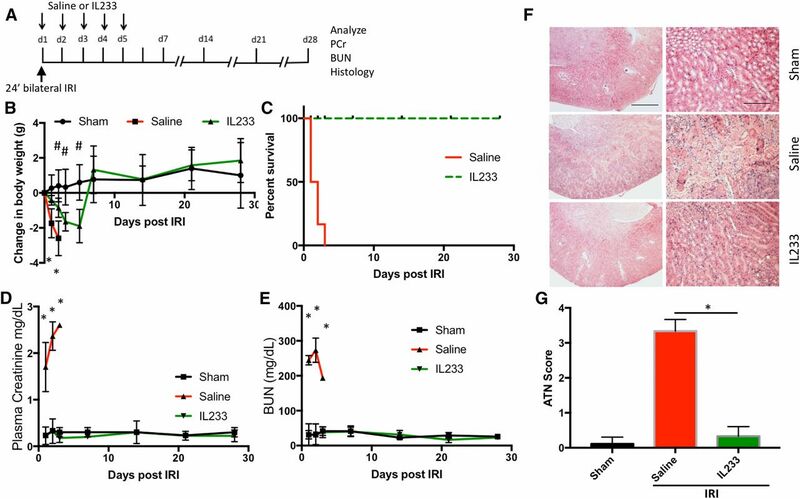 (D) A higher ATN score (representative images of hematoxylin and eosin–stained kidney sections are shown in Supplemental Figure 6D) was observed in saline-pretreated mice compared with IL233-pretreated mice, who had almost no renal damage. n=10; mean±SEM is shown. *P<0.05; **P<0.01; ***P<0.001. IL233 protects from doxorubicin-induced nephrotoxic injury. (A) Balb/c mice (12 weeks old), treated for 5 days with saline or 66 pmol per mouse per day of IL233, were injected with saline (control) or 10 mg/kg doxorubicin (administered intravenously) 3 days after the last IL233 injection and followed for 4 weeks. The saline-pretreated mice showed reduced renal function after doxorubicin injection as shown by higher PCr (B) and BUN values (C) on necropsy at week 4, whereas the mice pretreated with IL233 before doxorubicin administration had PCr and BUN values similar to untreated control mice. (D) Compared with saline-only controls, mice pretreated with saline and administered doxorubicin had marked renal damage (representative hematoxylin and eosin–stained tissue sections are shown in Supplemental Figure 7D), which was strongly inhibited in IL233-pretreated and doxorubicin-injected mice. Symbols represent individual mice; mean±SEM is shown. *P<0.05; **P<0.01. A.U., arbitrary units. We show that IL-2 and IL-33 act cooperatively to promote Treg homeostasis better than either cytokine alone. IL-33 induces IL-2 production from dendritic cells (DCs) to selectively enhance ST2+ Tregs.42 IL-33 promotes proliferation of Tregs and stabilizes Foxp3 mRNA by recruitment of RNA polymerase II and GATA3 to the Foxp3 locus, further supporting our finding that IL-2 and IL-33 used in combination is a much better approach to expand Tregs41 to preserve renal structure and function by suppressing inflammation. Because several cell types express the receptors for IL-2 and IL-33, we further hypothesized that linking IL-2 and IL-33 in the form of IL233 fusion cytokine would be more effective than IL-2 and IL-33 used as a mixture. Indeed, IL233 was more effective than IL-2 and IL-33 used as a mixture, which in turn was more effective than either cytokine alone, suggesting that linking IL-2 and IL-33 activities in a single molecule has a synergistic effect on Tregs. There could be multiple explanations for the greater efficacy of the fusion cytokine over the mixture of the two. First is the restrictive targeting of the IL-33 activity to Tregs because of tagging it with IL-2 as a handle. Tregs have the highest expression of CD25 compared with any other cell type, such that low dose IL-2 is preferentially taken up by Tregs.43 By this virtue, the majority of IL-33 activity in the IL233 fusion cytokine could be made available to Tregs. Second, IL-2 enhances the responsiveness of Tregs to IL-33 by simultaneously upregulating ST2 expression and providing the ligand in the vicinity. A third possibility could be an increase in the avidity of the binding of two molecules to a cell expressing receptors for both IL-2 and IL-33. Another possibility to be tested in our future studies is that joining IL-2 and IL-33 may increase the t1/2 of each cytokine. The t1/2 of IL-2 is <4 minutes after intravenous injection and up to 2 hours upon intraperitoneal injection,44 whereas the t1/2 of IL-33 is unknown. Interestingly, a recent study proposed that, once released from cells, IL-33 is rapidly oxidized to a lower active form.45 It is possible that linking of IL-2 and IL-33 in one molecule may protect the critical IL-33 cysteine residues from oxidation, and conversely, IL-33 may prolong the t1/2 of IL-2 similar to IL-2C.46 We propose that IL233 may bind to both IL-2 and IL-33 receptors either on the same cell or may bind to adjacent cells in a fraternal manner (Figure 9). Proposed model for the protective function of IL233 fusion cytokine in AKI. IL233 fusion cytokine may bind to IL-2 and IL-33 receptors on the same (left) or adjacent (right) cells to simultaneously enhance the proliferation, activation, and mobilization of Tregs and ILC2 to prevent inflammation and AKI. It is possible that in addition to increasing the number of Tregs and enhancing the CD4+ T cell suppressive function in vitro, IL233 treatment also promotes their mobilization from spleen and recruitment to injured kidneys. IL233-treated mice undergoing IRI had a reduced proportion of Tregs in the spleen. Correspondingly, much higher numbers of Tregs were found in the kidneys of mice undergoing IRI that were pretreated with IL233 (2.9×104/g kidney weight) compared with saline-treated (0.8×104/g kidney weight) or sham-operated (0.7×104/g kidney weight) mice. The spleen may serve as a reservoir for Tregs, and ST2 expression enables them to respond to IL-33, which may be released from damaged cells during tissue injury. Regulatory DCs protect from IRI through enrichment of Tregs in the spleen in a CCL22-dependent manner.47 IL-33 is upregulated in the kidney as a result of cisplatin-induced injury and mediates recruitment of CD4+ T cells.48 We believe that IL-33 may also be released from damaged kidneys upon IRI to serve as a signal for Tregs trafficking to the kidneys. Pretreatment with IL233 may sensitize Tregs to respond to IL-33 during acute injuries, as indicated by higher CD25 and ST2 expression in IL233-treated mice compared with saline controls (Supplemental Figure 8). In the kidneys of mice undergoing IRI, IL233 increased the levels of ILC2, which express both CD25 and ST2. Adoptive transfer of ILC2 by themselves protected from IRI, as has been shown before.49 Although IL-2 and IL-33 are known to upregulate Th2 responses, we did not observe strong evidence for the increase of Th2 response in the spleen and kidneys of IL233-treated mice in the timeframe of IRI (Supplemental Figure 9), but this may be important in long-term studies. Thus, IL233 increases both Treg and ILC2 to protect from IRI. Future studies will explore these mechanisms in mice with a conditional deficiency of IL-33/ST2 in individual cell types. IL233 also protected mice from drug-induced nephrotoxicity. Because patients with cancer are prescribed cisplatin or doxorubicin in a known timeframe, pretreatment with the IL233 hybrid cytokine may offer an approach to protect patients from nephrotoxicity. Cisplatin increases IL-33 in circulation and the kidneys, and IL-33 exacerbates cisplatin-induced renal injury, whereas inhibition of IL-33 with soluble ST2 attenuates AKI.48 Further, it was proposed that IL-33, which was protective in atherosclerosis by inducing a Th2 bias,50 is proinflammatory by recruiting Th2 cells to kidneys. Depletion of CD4+ T cells in this study was protective; however, the role of Tregs was not investigated. Here, we pretreated mice with IL233, thereby increasing Tregs before cisplatin administration. Secondly, IL-33 was injected as a fusion with IL-2 and at a lower dose, thus biasing IL-33 activity preferentially to Tregs, whereas in the study by Akcay et al.,48 IL-33 injected at a higher dose could have activated inflammatory cells. Finally, the finding that IL233 is protective when administered after IRI opens up the possibility of using IL233 therapeutically in clinical settings. The IL-2/anti–IL-2 complex was also shown to protect kidneys in a model of unilateral IRI, when given therapeutically.39 In our study, therapy with IL233 in bilateral ischemia prevented mortality and provided complete protection. Treatment with IL233 cytokine may also elicit other anti-inflammatory mechanisms, including greater IL-10 production in response to IL-2,51 Th2 skewing, or induction of M2 macrophages, which should be tested in future studies. Defects in IL-2 have been linked to Treg paucity in autoimmune diabetes and lupus nephritis.52,53 We found that the cooperation of IL-2 and IL-33, especially in the form of the IL233 fusion protein, offers lifelong remission in murine models of these diseases (R. Sharma, M.E. Stremska, and S. Jose, unpublished observations). Thus, we demonstrate for the first time that IL-2 and IL-33 cooperate to promote the homeostasis and activation of Tregs and ILC2 to inhibit inflammation and protect from AKI in IRI and cisplatin- and doxorubicin-induced kidney injury. We have generated a novel hybrid cytokine (IL233) that offers better synergy of IL-2 and IL-33 than either cytokine used alone or as a mixture. The hybrid cytokine has strong therapeutic potential and warrants further pharmacokinetic and safety studies for bench to bedside translation. All procedures were approved by the University of Virginia Institutional Animal Care and Use Committee and were conducted in accordance with the National Institutes of Health Guide for the Care and Use of Laboratory Animals. Male (8–10 weeks old) C57BL/6J (B6), Balb/cJ (Balb/c), B6.Cg-Foxp3tm2Tch/J (Foxp3-gfp), and B6.PL-Thy1a/CyJ (B6.Thy1.1) mice were purchased from Jackson Laboratories. Mice were injected intraperitoneally with different doses of cytokines daily for different times, either before or after induction of ischemia, as indicated in the corresponding figure legends. Surgical procedures involving flank incisions and clamping both renal pedicles for 26 minutes were performed as previously described.54 After removing the clamps, kidneys were allowed to reperfuse for 24 hours (or in some experiments, for 28 days after 24 minutes of ischemia) before euthanasia. For surgical procedures, mice were anesthetized with an intraperitoneal injection of ketamine (120 mg/kg) and xylazine (12 mg/kg). Buprenorphine (0.15 mg/kg) was used as analgesic administered immediately after and at 8 hours after surgery. For cisplatin studies, 12-week-old B6 mice were treated with IL233 cytokine as mentioned in the Results, and intraperitoneally injected with cisplatin (20 mg/kg). All of the chemicals were procured from Sigma Chemicals, unless otherwise specified. For doxorubicin studies, 12-week-old Balb/c mice were pretreated with saline or 66 pmol of IL233 for five consecutive days, before intravenous injection of 10 mg/kg doxorubicin. In adoptive transfer studies, syngeneic Tregs were isolated using the CD4+CD25+ Regulatory T Cell Isolation Kit (Miltenyi Biotec), as previously described,16,55 from mice that were treated either with saline or IL233. Different numbers of cells (50×103 or 100×103) were intravenously injected into recipient mice 24 hours before surgery. Treg suppression activity was performed using the CFSE dilution assay as previously described,31 with the modification that CD4+CD25− responder T cells were isolated from the spleens of B6.Thy1.1 congenic mice for unambiguous analysis by gating on Thy1.1+ cells. ILC2 were identified in flow cytometry as lineage negative Thy1.2+ST2+ cells in the lymphocyte or CD45+ gate, using fluorescence-labeled antibodies (Biolegend Inc.). ILC2 were isolated from the spleen of untreated mice by negative selection using biotinylated α-CD4, α-CD8, α-CD11c, α-CD11b, α-NK1.1, α-B220, α-Ter119, α-Gr-1 (BD Biosciences), and anti-biotin magnetic beads (Miltenyi Biotec). Cells were expanded for 2 weeks in complete media (RPMI 1640 +L-glutamine, 10% FBS, 1 mM sodium pyruvate, 1.5 g/L sodium bicarbonate, 10 mM HEPES, 25 mM glucose, 0.05 mM β-mercaptoethanol, 10 ml/L penicillin/streptomycin) as described.56 The cultures were split at the ratio of 1:3 every third day, with the difference that instead of IL-2 and IL-33, 50 ng/ml of IL233 was used to induce the growth of ILC2. ILC2 were adoptively transferred (5×105 cells per mouse, administered intravenously) into syngeneic recipient mice 24 hours before IRI. The control mice were injected with saline only. The purity of ILC2 and Tregs was >95% as measured by flow cytometry, using a five-color upgraded (Cytek Development) FACScan (BD Biosciences) equipped with CellQuest, and Rainbow software for data acquisition. Murine naïve CD4+ T cells were isolated first by negative selection using the CD4+ T cell isolation kit (Miltenyi Biotech) following the manufacturer’s directions, and then by flow-assisted cell sorting of CD3+CD4+CD44lo cells at the University of Virginia Flow Cytometry Core Facility. Subsequently, the naïve T cells were cultured in complete media (105 cells per well in a round bottom, 96-well plate) and activated with anti-CD3/CD28 T cell activation beads (Invitrogen) for 4 days to generate activated T cells (Teff) according to the manufacturer’s protocol. In addition, naïve T cells were cultured under Th1, Th2, and iTr polarizing conditions as previously described,57,58 with minor modifications. Briefly, for Th1 differentiation, the Teff cultures were supplemented with IL-4 neutralizing antibody (10 μg/ml, clone 11B11; eBioscience), recombinant murine (rm) IL-12 (10 ng/ml, rmIL-12; PeproTech), and rmIFN-γ (10 ng/ml, IFN-γ; R&D Systems). For Th2 differentiation, the Teff cultures were cultured in the presence of anti–IFN-γ neutralizing antibody (10 μg/ml, clone XMG1.2; Biolegend) and rmIL-4 (10 ng/ml; R&D Systems). For iTr differentiation, the Teff cultures were supplemented with 1 ng/ml rmTGFβ (PeproTech) and 50 ng/ml rmIL-2. The nTrs (CD4+Foxp3-GFP+ cells) were sorted using flow-assisted cell sorting from single-cell suspension of spleens of naïve Foxp3-gfp mice at the University of Virginia Flow Cytometry Core Facility. The novel fusion cytokine IL233 and rmIL-2 (aa 21–169) and rmIL-33 (aa 109–266) were produced in E. coli and purified to homogeneity. The design and coding sequence for IL233 is shown in Supplemental Figure 1. Briefly, the coding sequence for IL233 containing murine IL-2 (aa 21–169), a 15-aa linker (GGGGS)3 and mature murine IL-33 (aa 109–266) was synthesized using overlapping oligonucleotides and PCR. The synthesized gene was verified by sequencing and cloned in a modified pET44 expression vector (EMD Millipore) for inclusion of a cleavage site for TEV protease to generate pRSm233T. Similarly, the synthetic genes for IL-2 (aa 21–169) and IL-33 (aa 109–266) alone were also cloned in the modified pET44 vector to generate plasmids pRSm2T and pRSm33T, for expression of rmIL-2 and rmIL-33 cytokine domains, respectively, using standard molecular biology techniques. PCr was measured using a colorimetric assay, as previously described.16 BUN was measured using a colorimetric assay kit according to the manufacturer’s protocols (Arbor Assays). Harvested kidneys were fixed in 4% paraformaldehyde/lysine/periodate and paraffin-embedded. Kidney morphology in hematoxylin and eosin–stained tissue sections was analyzed with light microscopy, and ATN was scored blindly by assessing tubules affected by necrosis in three different random areas throughout the tissue. The scoring represents no areas of necrosis (0), up to 25% necrosis (1), 25%–50% necrosis (2), 50%–75% necrosis (3), and 75%–100% necrosis (4). In doxorubicin experiments, an additional histopathological point was added if glomerular hypertrophy, mesangial expansion, and glomerulosclerosis were present. Flow cytometer data analysis was performed using FlowJo (Tree Star, Inc., Ashland, OR). Quantification, graphs, and statistics were performed using GraphPad Prism 7 software with statistical analysis by two-way ANOVA. The data are shown as mean with error bars representing SEM. The longitudinal analyses were also performed by two-way ANOVA with repeated measures. A patent was filed for the use of the IL233 hybrid cytokine and the combination of IL-2 and IL-33 for the prevention and therapy of inflammatory and autoimmune diseases (patent no. PCT/US2014/056767; inventors R.S. and M.D.O.). We thank Hong Ye for technical assistance, the University of Virginia (UVA) Research Histology Core for processing tissue samples, and the UVA Flow Cytometry Core Facility. The histology data were gathered on an MBF Bioscience and Zeiss microscope system for stereology and tissue morphology. M.E.S., A.B., G.R.K., P.R.S., D.L.R., and R.S. designed the research studies. M.E.S., S.J., V.S., L.H., A.B., G.R.K., P.R.S., S.M., and D.L.R. conducted experiments and acquired and analyzed data. M.E.S., D.L.R., and R.S. wrote the manuscript. The UVA Flow Cytometry Core Facility is supported through the UVA Cancer Center National Cancer Institute grant P30-CA044579-23. The MBF Bioscience and Zeiss microscope system is funded by National Institutes of Health (NIH) grant 1S10RR026799-01 (to M.D.O.). Research reported in this publication was supported by the National Institute of Diabetes and Kidney Diseases and National Institute of Allergy and Infectious Diseases of the NIH, under award numbers 1R01DK105833 (to R.S. and Shu Man Fu), 2R01AI116725 (Subcontract from Fred Perrino, Wake Forest University to R.S. ), 1R01DK104963 (to G.R.K. ), 1R01DK104963 (to M.D.O. ), R01DK062324 (to M.D.O. ), and K01DK088967 (to A.B. ); a UVA AstraZeneca Research Alliance award (to R.S. ); and the LaunchPad Diabetes Fund (to R.S.). The content is solely the responsibility of the authors and does not necessarily represent the official views of the NIH or other funding agencies. This article contains supplemental material online at http://jasn.asnjournals.org/lookup/suppl/doi:10.1681/ASN.2016121272/-/DCSupplemental.